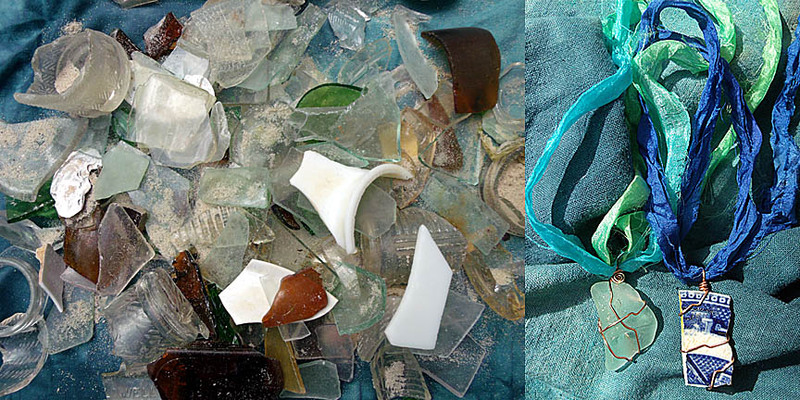 Some call beach glass “trash”… others call it “treasure”. I guess it just depends on your perspective. For years, I’ve been searching for tiny bits of sunshiny color on the beach. Finding the perfect shell is always a thrill, but finding a bright green or blue blob of beach glass, just the right size for a wire-wrapped necklace, is like finding buried treasure! It has to be ripe too — worn down by the waves and sandy bottom until sugar coated and smooth. The Chesapeake Bay is full of glass, I assume from years of dumping along it’s edges. Plenty of it washes up on the beaches of Cape Charles, some ripe and sanded and perfect for jewelry making, some still shiny and jagged and ready for the recycle bin. We gathered as much of both as we could on our weekend tribal adventure -12 gals in Paula’s cute little beach cottage in an even cuter little town on Virginia’s Eastern Shore. I will eventually sort thru my glass bag and cherry pick all the ripe pieces out for jewelry. Maybe I will keep the rest for a new “glass garden” to remind me of Paula’s place and her hospitality. I’ve known some of the girls in my Tribe since I met them at a Bluegrass Festival in my early twenties. We’ve seen each other thru dating, marriages, jobs, children and now we are facing empty nests and (sooner-than-later) grandchildren together. Like sea glass, our friendship has been shaped by time and tide — 30 years of beach trips and working and loving and living. 30 years of slowly smoothing our jagged edges. The treasure lies in knowing that they are always there. 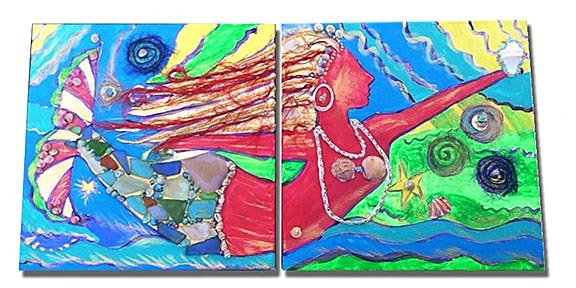 Charity the Mermaid, our weekend collaborative art project, is shown below. Sandy Boo headed up the project, a donation for a silent auction for a friend of a friend. Collaborative art projects can be difficult with so many opinions and personalities going into them, but I think this one turned out especially nice. It comes with much love and well wishes for the recipient. WHAT I LEARNED: Artful adventures are right around the corner… or right over the bridge (which happens to be one of the Seven Engineering Wonders of the Modern World). WHAT I LOVED: I loved spending time with my Tribe, and loved the little hamlets of the Eastern Shore — like stepping back in time. A long walk, wild golf cart rides thru every inch of Cape Charles, all of us in one SUV on the backroads from bay to ocean and back, lunch at the Exmore Diner, oddities at the antique stores, the beach glass honey hole, and Paula’s sweet little cottage. This entry was posted in Uncategorized and tagged adventure, art, eastern shore, jewelry, mermaid, sea glass, tribe, virginia by Sandy Lupton. Bookmark the permalink.